All units are self-contained and are constructed with two separate compartments to house the fresh and waste water. We supply the paper towel and fresh water upon set up. Only the Applause Series has built in garbage bag mounts. The customer must supply garbage containers for the other units. A few of the older units are available as a monthly rental. The majority are used as short term weekend rentals. Click on images for larger view. 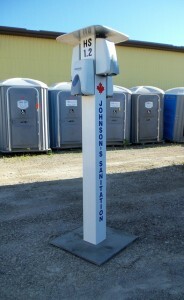 No power requirements (foot pump for water spout and hand pump for soap). 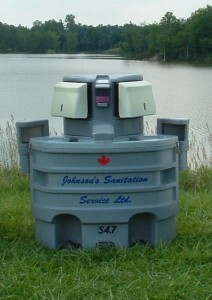 This unit holds 21 gallons of fresh water. It has 2 basins, 2 soap dispensers, 2 paper towel dispensers. 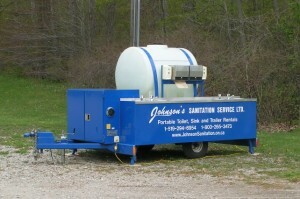 This unit holds 60 gallons of fresh water. This unit holds 20 gallons of fresh water. It has 4 basins, 4 soap dispensers, 4 paper towel dispensers. 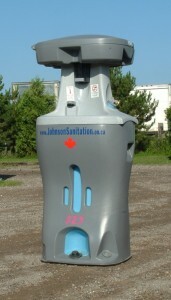 The stand has 4 dispensers containing an alcohol based sanitize. No paper towel required or supplied. water pump to feed the chrome taps. 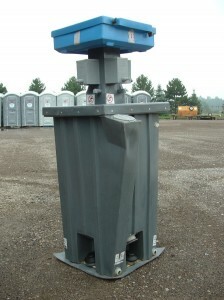 This unit is designed to handle large crowds. Due to it’s large size, it is towed behind a truck. The top center white tank, is a 180 gallon fresh water supply. Beneath it an equal size galvanized waste water tank. Front cabinet houses water pump and water heater.